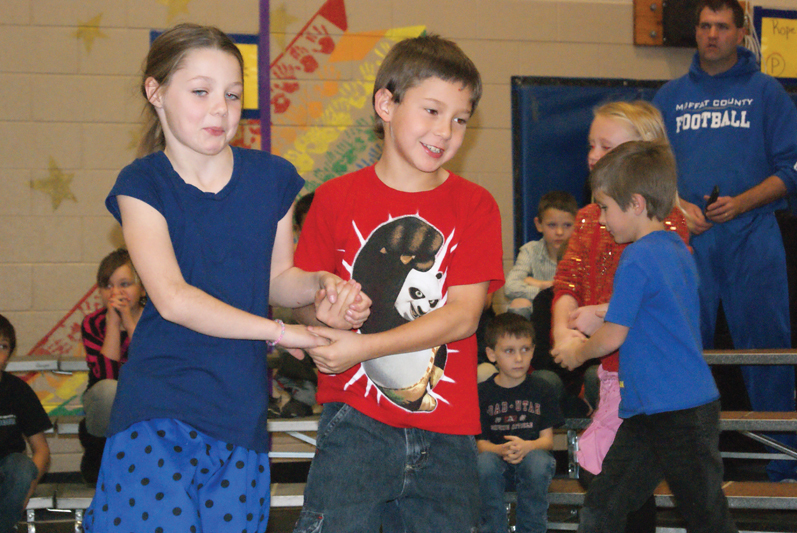 Ridgeview Elementary School second graders, Malia Graham, left, and Kyton Rodriguez, perform a line dance during their school concert Thursday afternoon. The Ridgeview Elementary School gym was filled with angelic little voices Thursday afternoon as first-, second- and third-graders took turns performing their favorite songs during a school concert for their peers. A riveted audience sang along with most songs, knowing them from when they were in the younger grades. Physical education teacher Matt Ray and music teacher Phyllis Reed teamed up to include dancing and singing in the concert. First graders performed the bunny hop and toward the end of their singing, second graders did a line dance and third graders undertook the Virginia Reel dance. Reed said the concert was special for students because she said they get to watch each other grow up, building on what they learn each year. Students repeated the performance later in the evening for parents and other family members.